...Rufus, Lucy, and their new soldier race through Paris with a young Ernest Hemingway to keep history intact (with an assist from Josephine Baker). Also: a despondent Wyatt receives a visit from Agent Christopher. Den of Geek - Centering the mission on Rittenhouse in this week’s Timeless raises intriguing questions about fate and free will. Something went screwy with my tivo and chopped out a good chunk of the middle (i.e. how Lucy ended up in the catacombs with Lindbergh), so I'll have to go back and re-watch it from on-demand at some point. I don't know - I loved most of it (everything with Rufus, Josephine Baker, Agent Christopher, and Wyatt. The incongruity of seeing Jim Beaver playing anyone but Supernatural's Bobby; at any moment I expect him to call Sam & Dean). But the idea of Lindbergh as a poor-woobie pawn of Rittenhouse rather than an actual white supremacist/Nazi? Nope, not interested in that kind of nonsense in light of current events. I'll give the writers credit for shaking up the status quo and for putting the team in a difficult position. How Wyatt expects to protect his colleagues when he's on the run from the government and can't go on missions is beyond my imagination but I'm curious to see how it will play out. It makes perfect sense for Rittenhouse to have taken over the project. I'm just surprised they didn't do it sooner. Yeah the redemption of Charles Lindberg sorta stuck in my craw. Otherwise a fun episode though. You need to do yourself a favor and go watch Deadwood, right now. I'm liking this newfound willingness to shake up the status quo. It definitely makes sense for Rittenhouse to be getting involved at this point; I'm sure they preferred to stay behind-the-scenes for as long as they could, but now that it doesn't seem to be working, a more active involvement is the next logical step. But the idea of Lindbergh as a poor-woobie pawn of Rittenhouse rather than an actual white supremacist/Nazi? Nope, not interested in that kind of nonsense in light of current events. The thing is, Lucy's heartfelt speech to him had zero effect. We don't know why; maybe he came around to agreeing with the white supremacist ideas, over time. At best he was just a complete coward. All we know is ultimately, he wasn't redeemed. In light of current events, I am okay with suggesting that not all bad people can be redeemed via heartfelt, nonviolent speechifying. I felt like it was a nice subversion of the usual tropes. I am curious about what Lucy's bio-dad meant when he said they're not exactly what she and Flynn thinks they're like. Like is there really more layers to them? Are they just not as evil as they seem? And is Flynn really the big bad? I know this is way, way too simplistic, but if Lucy has the journal in her hands, can't she just destroy it (toss it in the fire) and thereby prevent a) her from actually using it and b) it falling into Flynn's hands? 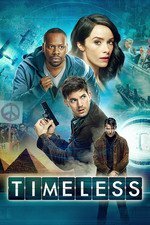 I think the challenge I'm having with Timeless is that the supposed reason for tuning in - ooh, time travel, history, hot geezers! etc is kind of wearing thin, even though I'm enjoying the Rittenhouse, prime timeline story, and kind of want to know how it turns out. So I find myself sort of zoning out and reading Twitter during the historical segments, only perking up my ears when they mention Yet Another Rittenhouse connection. Ha, I glaze over during Rittenhouse and perk up during the history stuff. The casting has been really fun. I'm betting there's some sort of twist eventually where Lucy plays the long game and writes false information in the journal to mislead/trap Flynn. There may be some sort of additional reversal/reverse-reversal depending on whether she trusts Flynn or Rittenhouse more. Yeah the redemption of Charles Lindberg sorta stuck in my craw. I didn't see that as redemption at all. If anything from my perspective it makes him worse in the at least it's an ethos manner. If they had established him as being blackmailed in some way, his loved ones threatened a la Rufus, perhaps. But there was none of that. This was just someone who discovers that he's in this privileged position because of ugly things his family did and now is presented with an ultimatum that he needs to behave in a way he knows is repellent or he's going to lose his status and all these things he has inherited because of past ugly. Despite the shame he exhibits to Lucy... he goes ahead and does it all anyway. Personally I view the person who simply uses bigotry and hate for self advancement to be about 3% more abhorrent than someone who was raised ignorant. Not giving a pass to the "true" bigot, but they may at least have the possibility or learning better and repenting. Lindberg here does not have the possibility of redemption in that way because he has already seen the choice and chosen poorly. If it wasn't for Shawn Ryan's involvement here I'd be fine with not thinking this was deliberate but the person behind The Shield is well acquainted in dabbling with moral decisions on screen. It may not even be a coincidence that we get this right on the heels of Wyatt's efforts to do something good and committing manslaughter in the process. It's certainly no coincidence that Lindberg is at almost the exact same place that Lucy is - newly discovered his place in this conspiracy - and that we also have this diary spectre that might indicate she falls in line for a while and perhaps later gives Flynn the diary in her own effort at redemption. Or perhaps she rejects it completely. Either way, she's facing a decision and we see that Lindberg made the wrong one. We also have Rufus' past complicity with Rittenhouse and recent complicity in Wyatt's killing of an innocent man. Agent Christopher makes her own choice in this episode. In the previous episode Anthony makes a decision to betray his current side and dies for it. In recent ones Connor Mason, after Rufus tells him to pick a side, chooses Rittenhouse. You can make the case that portraying Lindberg as having had misgivings at one point softens him in the general person's mind, but I think this show pretty consistently takes the "results are far more weighty than intentions" position. So if people take it as absolution I don't think that's at all what the writers intend.